Measure your Fill Rate easily, Know What your Fill Rate is, what it was or will be? The Fill Rate your inventory provides is the measure of its performance. It’s the likelihood of your customers finding what they want, on-hand ready to ship to them. But, do you know your Fill Rate—80%, 89, 97? Do you know what it was or will be? Would you like to know your Fill Rate? We’ll tell you. With a simple download of inventory data, we’ll calculate what your customers experience. It’s free. Call us at (312) 346-5080 if you’re interested in knowing what you customers experience. Or drop us an email to admin@chicago-consulting.com and say you’d like to know your Fill Rate. Few organizations measure Fill Rate. How many of us know what our Fill Rate is, what it was or will be? How many have KPIs that measure Fill Rate? Measuring Fill Rate is thought to be hard. Not so. There’s an easy way. When customers seek the products they want they often ask “do you have it?” Then the sale is made by having it on the shelf, having inventory availability. “If you have it, they will come.” This is the perspective behind virtually all distributors and most retailers, the perspective around random demand. Secondarily, having the inventory customers want for their immediate needs motivates them to come back the next time around. Having found what they wanted convinces them to try the same supplier again next time. The opposite dooms many; not having what customers want loses that sale and lessens future inquiries. Business after business lives and dies on supplying random demand from its inventory. The measure of inventory availability is Fill Rate─the likelihood or probability that a customer will find what they want. Many speculate on what their Fill Rate is. They say “we want 98% Fill Rate” not understanding what their Fill Rate is or the consequences of that or any other number. On the upside, high Fill Rates sustain the business through immediate and repeat sales. On the downside, high Fill Rates require cash, cash for inventory that’s at risk of obsolescence and must be housed and protected. That’s why Fill Rate is the measure of inventory performance. It’s so important that it’s worth measuring it very thoroughly. Suppose we have a 10-item inventory subject to random demand. We have a forecast of each item and we know our on-hand position. Then the Fill Rate of the “next” random demand of one unit of any item will be 100% if that item has a positive on-hand and zero otherwise. But each item is ordered with a frequency proportional to the forecasts. 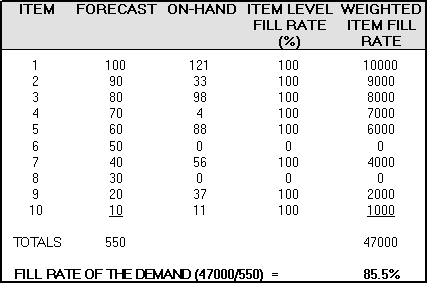 So, the Fill Rate of the whole inventory is the ITEM FILL RATES, weighted by the forecast. This Fill Rate is an unbiased measure of the Fill Rate of the next random demand for one unit. This measure can be taken at any time. If the times at which such measurements are taken are themselves unbiased, then the repetitive calculation of these Fill Rates will the best possible representation of what customers actually experience. Because this is a measure at the one-unit level it is the most optimistic measure of Fill Rate. If customers request more than one unit, that could be accounted for in the ITEM FILL RATE column. For example, if customers ask for five units each time, the ITEM FILL RATE of item four would be 80% and the FILL RATE of the whole inventory would be correspondingly lower. This Fill Rate measure is extremely simple to put into use. All it takes is the forecast and the on-hand of the inventory. Additional measures can account for demand complexities such as multiple units and multiple items ordered by customers. You’re a simple calculation away from measuring your actual inventory performance, your Fill Rate. This is the most important KPI that makes immediate sales and keeps customers coming back. It measures what you customers experience when they atemp tp buy from you. Any questions on the practicalities of deploying this in your organization can be directed to Terry Harris terry@chciago-consulting.com. We welcome your comments and feedback. Thank you for reading.